Codie with a protective collar on as she recovers from her horror ordeal. POLICE have issued descriptions of two males they want to speak to in relation to the attack on a dog in Maghaberry at the weekend. The pair were spotted with Codie on Trummery Lane close to the quarry at around loam last Sunday morning. One of the males is described as of medium height between 5' 8" and 5' 10' tall of a thin build with broad shoulders with dark hair, faint moustache and was wearing a grey top possibly a hoody and similar coloured tracksuit bottoms. He is also described as having an aggressive demeanour and was carrying a bottle of Buckfast. The second male is described as being of a similar height and build and was carrying a white plastic bag. Officers believe the two males may have been socialising in the Maghaberry area the previous night, possibly at a house party and they would like to hear from anyone who believes they know these males or who recognises the description. They can be contacted on 0845 600 8000. Or if someone would prefer to provide information without giving their details they can contact the independent charity Crimestoppers and speak to them anonymously on 0800 555111. News of Codie's ordeal has really tugged on the heartstrings of local people. Two fundraising pages to help the family cover veterinary bills have already been set up on the internet and have raised a combined total in excess of £5,000. A dog groomer from Maghaberry has even offered his services free of charge to help with Codies grooming once he is fit enough to come home. 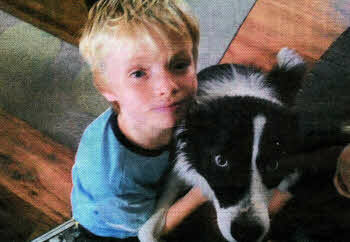 Codie who was set alight by teenagers. FOLLOWING the horror attack on a defenceless family pet at the weekend we asked you to share your views on the incident. "What a senseless act of pure cruelty on a defenceless animal. We can only hope that the perpetrators are caught and held responsible for their actions." "Lisburn is a city full of dog lovers and everyone is outraged by this story. Those responsible need to be caught and made an example of as the law is too lenient on cruelty to animals. It has been mentioned on other news stories that it was teenagers who did this - if they are, they need help as goodness knows what they might be capable of as adults. "Somebody knows who did this. the scum should be taken out of the community before they hurt another wee innocent life." "Hate to think what these people that done that on a poor dog would do to a human life, hope they are caught and taken off our streets, evil people." PAGES which have been set up for people to donate money towards Codie's veterinary bills have been inundated with people sickened by what has happened to the innocent dog. So far donations exceed £5,000. Tara Purdy, 21, from Belfast, set up one of the pages even though she does not know Codie's owners. She said: "As a dog lover myself, this story broke my heart. I would like to raise money to help pay for Codie's medical bills. The dog is still at the vets where it shall have to stay for another few days until Codie can eat by itself. "What I am doing is giving all money to Codie's owners. The rest they can do with whatever they like, whether that be a life time supply of food for the dog, or as hundreds have suggested to me via email, other charities. It is up to the family to make this decision." Tara added: "I really do not deserve the praise for this. The praise should be aimed at the kind people/ families that have donated to the website so far. We all wish the best to Codie and his loving family." People have been donating whatever they can afford as they are appalled by what has happened to Codie. One donator said: "I know it's not much but it's all I can give at the moment. This broke my heart. I hope the lovely little pooch makes a speedy recovery and justice is brought to those who harmed her." Another wrote: "Breaks my heart thinking how anyone can do this." Family friend Vicky Wylie also set up a PayPal account and is delighted with the generous response. She said: "This was just a PayPal account set up by myself for Natalie and Martin for a few people who wished to make donations. I am overwhelmed by how many people are making donations between both sites. The support they are receiving is amazing." Martin Agnew said that he and his family have been overwhelmed by the generosity of people. "I just can't believe it. To be honest, I never even thought about the vet bills." Facebook page for more details on how to pay by PayPal https://www.facebook.com/justiceforcodythedog. 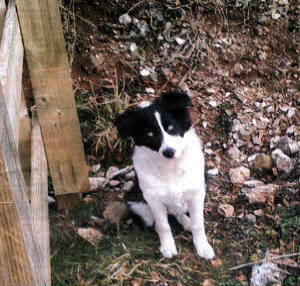 The Agnew family in Maghaberry has been left devastated after its pet dog was set alight at the weekend. 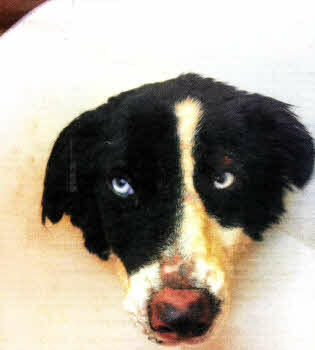 Codie, a three year old Collie was doused in flammable liquid before being burned alive in the Maghaberry Road area. Martin Agnew said his children Justin, 10, and Jake, six, saw two teenagers walking down their lane at around 9am towards a quarry on Sunday morning. Around an hour and a half later, the dog came running back burnt," he said. "We saw her running past the window all burned and bleeding. "It was just awful, one of her eyes was bloodshot, her nose had been burnt off and she is missing most of her fur. "She was unrecognisable," explained Mr Agnew. She had very little fur Ieft and big patches of raw flesh, it was not until we opened the door and smelt the burning that we realised it was her. "I'm sure she will not be the same again. She was so trusting of people and so friendly and a beautiful dog," he said. "We got her as a pup near Tyrella Beach and she will be four at Christmas time," Martin explained. The Agnews took Codie to vet Ian Moore in Moira, who was initially unsure if she would survive the burns. But the Collie is now walking about, albeit on strong pain relief, and the full extent of her injuries is not yet clear. Martin said on Wednesday that the dog is "getting itchy and loving bacon," but the vet won't know more until the dead skin falls away. Apparently she's going to look worse before she can get better, which is a bit scary considering how she did look." It could be a while before she is home if she has been burnt deep down," he explained. Ulster and Ireland international Stephen Ferris, who grew up nearby, and is a family friend was disgusted to learn what had happened to his friends' dog and described those who carried out the attack as "cruel" and asked his Twitter followers to contact him if they have any information. don't expect something like this to happen around this area. "I have a dog myself and animal cruelty is something I don't like at all and should be punished hard by the police." Over 30,000 people have left messages on a Facebook site from all over the world. Martin said: "We just can't believe it. "It's been very overwhelming. Everybody's been looking out and keeping their ear to the ground. It's not going to help our dog but it will maybe help somebody else's. If somebody can do that to a dog what can they do to anything?" he asked. It's a really friendly dog — wouldn't hurt a fly — and if you came in round our house the only risk would be getting licked to death," he added. "Luckily the boys didn't see it, we kept it away from them, but when we told them this morning they were in pieces. "I can't put on record what I think of the people who did this." Martin thanked the vet for his quick response in treating Codie. Alderman Allan Ewart said he was appalled when he heard about Codie. He said: "I know the family and have been in touch to pass on my disgust at this horrific incident. It is hard to believe that any human being would inflict such suffering on a defenceless dog. I appeal to the community if anyone knows anything about this cowardly attack to contact the police and ensure that the culprits are brought to justice. Maghaberry is a quite village and this has come as a complete shock to the residents. I trust the dog makes a complete recovery and it will soon be back with the Agnew family." Councillor Andrew Ewing, Chairman of the Lisburn Council's environmental Committee described the attack as "cruel and heinous" and appealed for people to come forward with any information which may assist police. Officers investigating this crime are appealing for witnesses or anyone with any other information to contact them at Lisburn police station on 0845 600 8000. Or if someone would prefer to provide information without giving their details they can contact the independent charity Crimestoppers and speak to them anonymously on 0800 555111. Codie is is doing as well as can be expected after her horrific ordeal.